With the advances of technology it seems that our work day would be more productive. Let’s face it, no matter how great the technology is, the most important factor for efficiency and output are the the employees who utilize the technology. It’s easy to get bogged down or distracted with the many different gadgets that technology offers or the speed in which information is shared or gathered. This overload can become a strain and impediment to your daily productivity. If you are facing a challenge in this area, here are five tips that will help you take back control of your day AND become more productive. Begin each day with a written”to-do” list. This list needs to be placed in a visible spot and include a tasks that are prioritized in order of importance. Be realistic in your estimation of time involved for each task, and leave some room for those unexpected needs that are sure to come into play each day. Let’s face it, there is usually one thing on your list that is not your your most favorite. It’s easy to become distracted or willingly choose other things to do as you dance around a dreaded task. It’s time to face the challenge and choose the dreaded task first! With this mental obstacle out of the way, the rest of your day will run more productively. It’s easy to get overwhelmed with a large task. To help you get started on such a task, break it down into individual mini-projects and assign them their own deadlines. As you complete each deadline, you will be more likely to stay on track and before you know it the task is done! Do you find yourself thinking of other things while sitting at your desk or in a meeting? This can happen especially if we have our smart phones nearby with various apps open. When you have to focus on a task, it’s best to disconnect and become fully focused. 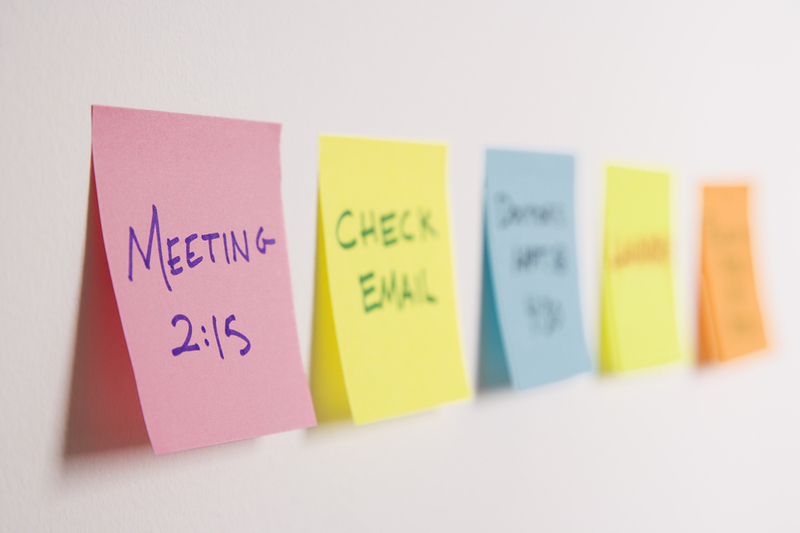 Leave some room in your To Do List for brief – prescheduled breaks to check/and respond to email or any social channel activity. This planning will pay big dividends in your productivity. Make sure that you are taking breaks from the computer screen and even away from your desk. These brief breaks can help to clear your mind, rest your eyes, and recharge your mind to help you succeed in getting through your to-do list for the day .